Kudos to Julius for such a playable game using such a small amount of external hardware. For more information and the Arduino sketch, head over to Julius' project page here. And we're on twitter and Google+, so follow us for news and product updates as well. 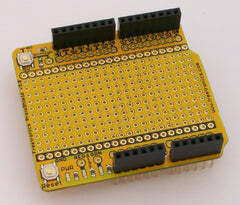 If you're working with Arduino projects like Julius' that require some external circuitry, consider one of our range of Protoshields. From the tiny LeoStick to the Mega range, we offer a complete range for you to work with.